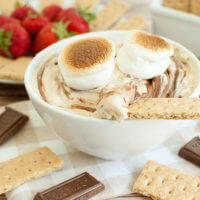 A fun spin on a S’mores Dip recipe! 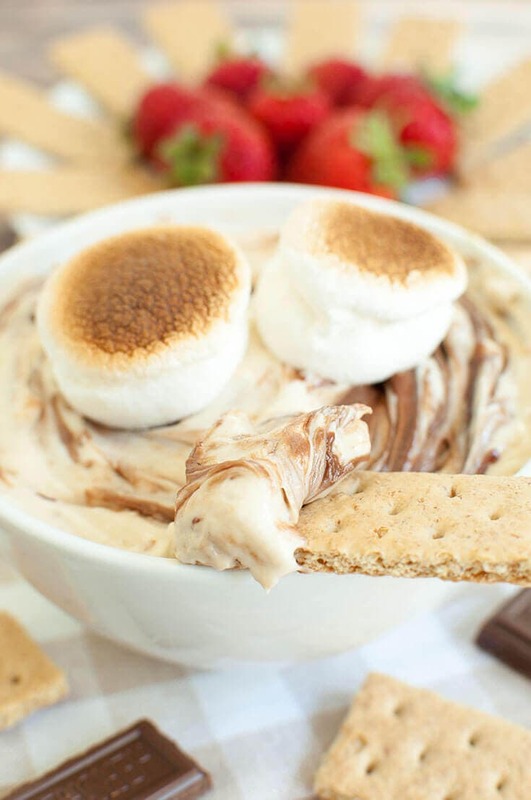 This sweet and creamy S’mores Dip is made with toasted marshmallows and melted Hershey’s chocolate bars. 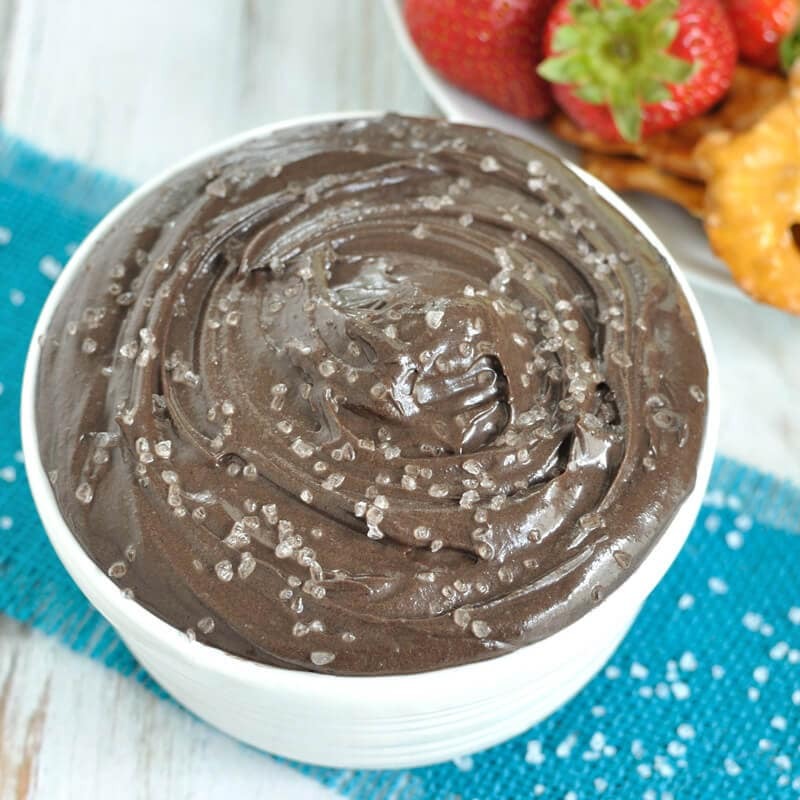 The sweetness of this dip makes it a great fruit dip, but it is also great with the more traditional graham crackers as dippers. I took this dip to one of my girl’s nights recently and after dinner, I was requested to bring it from the kitchen to the table on the porch where we were all sitting….I take that as a good sign 🙂 The favorite dipper seemed to be the strawberries although the graham crackers were a hit too. 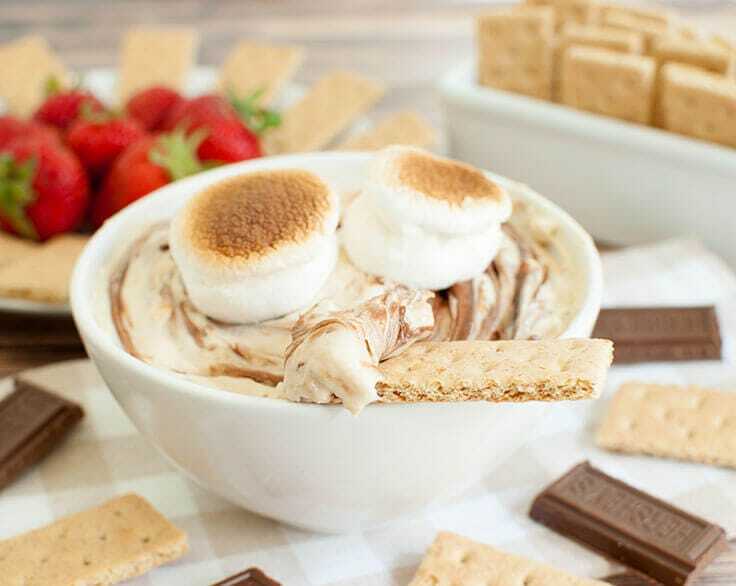 There are many variations of S’mores dip out there. I even have this S’mores Cheescake Dip on the blog which this particular recipe builds off of. What I like about this one though, is that you incorporate the toasted marshmallows into the dip itself. Yep, toast them and then mix them right into the cream cheese mixture! To toast the mini marshmallows for the dip, line a baking sheet with aluminium foil and spray with non-stick cook spray or grease with butter. This is an important step, otherwise, you’ll end up with a gooey mess. The marshmallows will scrape off easily so you can just toss them in the bowl and mix. There will still be small chunks of marshmallow in the dip, but that’s OK! S’mores and summer seem to go hand and hand, but S’mores are always in season if you ask me. 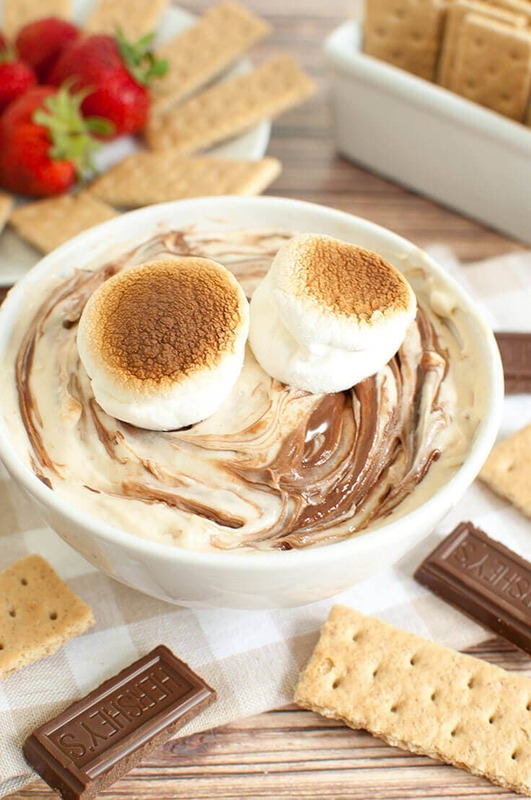 🙂 So enjoy the summer weather, grab a dipper (or a spoon) and dig into a bowl of this creamy S’mores Dip. Easy S'mores dessert recipe. 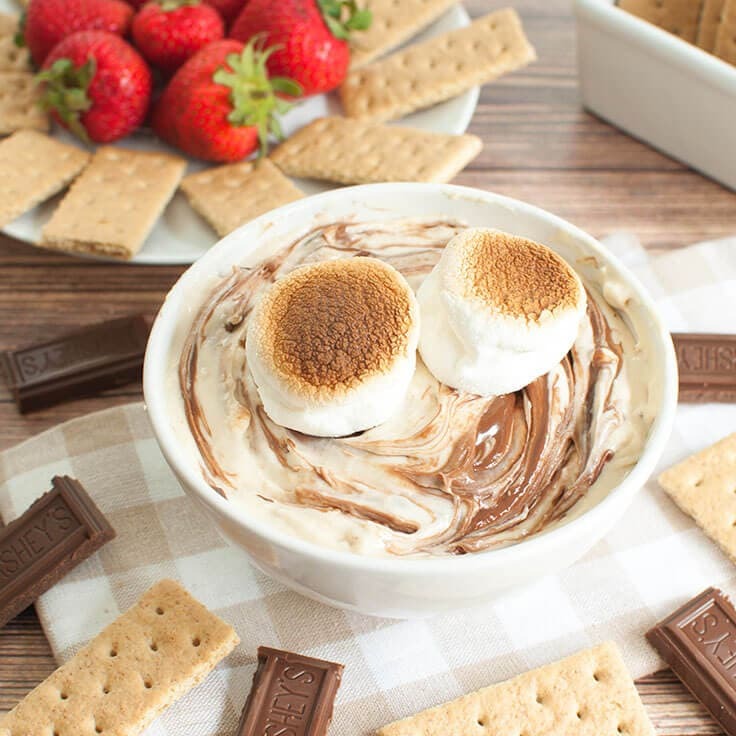 This creamy S'mores Dip with toasted marshmallows and Hershey's chocolate bars is great as a fruit dip or with graham crackers. Using a mixer on medium speed, beat the cream cheese until creamy. Slowly mix in the powdered sugar and then add in heavy cream and mix until combined. Line a baking sheet with aluminum foil. Spray with non-stick cooking spray or grease foil with butter. Spread out the entire bag of marshmallows into a single layer on to of foil. Broil marshmallows in the oven for 1-2 minutes or until tops are golden brown. Watch carefully as times vary by oven and marshmallows will burn quickly. Remove marshmallows from the oven and let cool slightly. Using a spoon or spatula, scrap the marshmallows up and place into the dip mixture. Mix on medium speed until the marshmallows are incorporated into the dip mixture. Some pieces of marshmallow will remain which is OK. Break up Hershey chocolate bars and place in a microwave safe bowl. Microwave on 50 percent power in 30 second increments. Stirring each time until chocolate is melted. Add a layer of the dip into a serving dish or bowl. Add a little bit of the melted chocolate on top of the dip and use a butter knife to swirl together. Repeat with another layer of dip and chocolate. Optionally, top with additional toasted marshmallows. 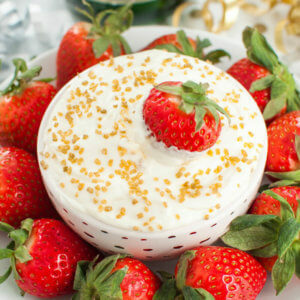 Serve with fresh fruit or graham crackers. 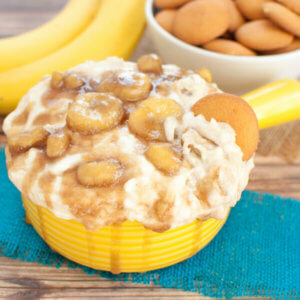 This looks sooo YUMMY!!!!!!!!!!!!! I could eat the whole bowl! I love s’mores so much! It always brings back great summer memories for me! I love that you made it into a dip! So great for sharing!